I know you're all wondering what in the world can this be? Well, it's cake mix using a fudge marble with a layer baked on top to make this a delicious Mock Italian Cassata found at Easter time. The original version has a crusty top and bottom, filled Ricotta cheese with cherries and chocolate sometimes dried fruits and nuts according to what Region of Italy is making it. This, however, is an imitation version of that really rich delightful dessert. 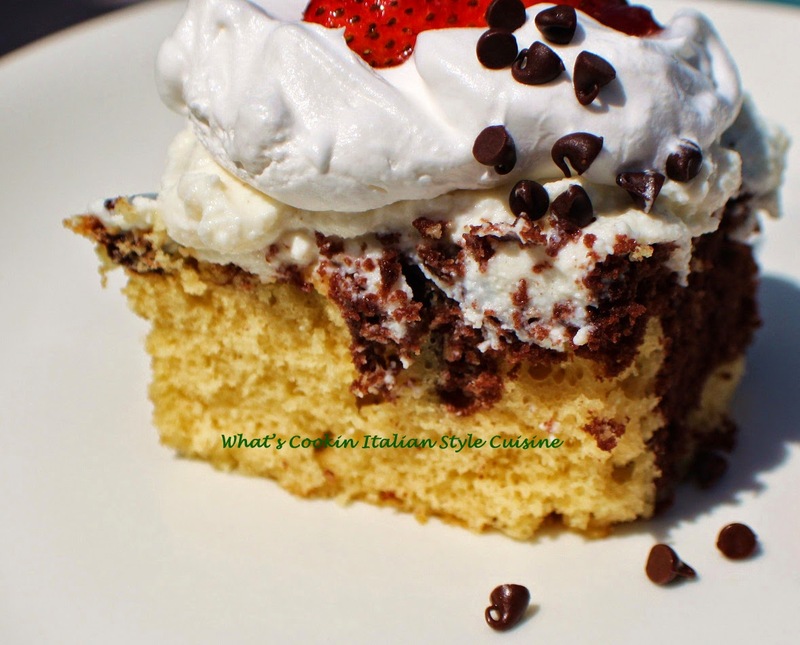 If your a hurried cook, or someone that says I am not a baker, you will want to wow your guests with this delicious semi-homemade cake, look no more you just found it. Check out this simple recipe below and I have to say it's pretty darn fantastic even being a quick imitation of the best dessert on our table at Easter. In a large mixer make the cake to you package instructions and pour into a greased 11x15 inch pan. Preheat oven to 350. In another large bowl mix together the cheese, sugar, eggs, cherries, and chocolate. Pour cheese topping over the cake batter and bake on 350 degrees for 1 hour. Cool and serve plain or choose a garnish (if desired) with whipped cream, sprinkle with mini chocolate chips and top with a strawberry.